Lecturer: Primate Socio-Ecology (graduate seminar). Dpt. Anthropology, Harvard University. Lecturer: Primate Socio Behavior. Dpt. Anthropology, Harvard University. Field Course: Animal Behavior, Primate Ecology. ITEC (Panama). Field Course: Animal Ecology. Dpt. Biological Sciences, UQÀM. Lecturer: Organisms and Environment. Dpt. Biological Sciences, UQÀM. Lecturer: General Ecology. Dpt. Biological Sciences, UQÀM. Teaching Assistantship: Animal Ecology. Dpt. Biol. Sciences, UQÀM. Chimpanzee Behavioral Ecology, Nutrition, Community Ecology, Coexistence Mechanisms, Evolution of Intelligence. Species of interest: primates, dolphins, elephants. Houle, A., C.A. Chapman, and W.L. Vickery (2010). Intratree vertical variation of fruit density and the nature of contest competition in frugivores. Behavioral Ecology & Sociobiology, 64: 429-441. Houle, A., W. L. Vickery, and C.A. Chapman (2007). Within-tree variation in fruit primary productivity among 18 tree species in Kibale National Park, Uganda. International Journal of primatology, 28: 1197-1217. Houle, A., W. L. Vickery, and C.A. Chapman (2006). Testing mechanismsof coexistence among two species of frugivorous primates. Journal of Animal Ecology, 75: 1034-1044. Houle, A., C.A. Chapman, and W. L. Vickery (2004). 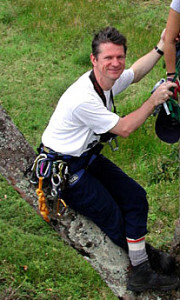 Tree climbing strategies for primate ecological studies. International Journal of Primatology, 25: 237-260. Llorente, M., J. Sabater Pi and A. Houle (2003). Possible association between Galago thomasi and Pan troglodytes schweinfurthii nest sites in the Kibale National Park, Uganda. Folia Primatologica, 74: 80-84. Houle, A. (1999). The origin of platyrrhines: An evaluation of the Antarctic scenario and the floating island model. American Journal of Physical Anthropology, 109: 541-559. Houle, A. (1998). Floating islands: a mode of long-distance dispersal for small and medium-sized terrestrial vertebrates. Diversity and Distributions, 4: 201-216.